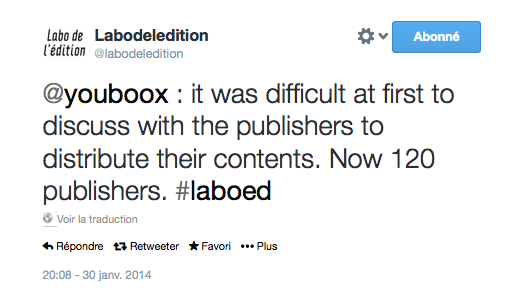 [VIDEO] Le Hackathon #Usages du Livre ! Revivez le hackathon #Usages du Livre qui s’est déroulé au Labo de l’édition du 12 au 14 décembre 2014. Développeurs, auteurs et concepteurs, graphistes et créatifs ont collaboré pendant tout un week-end avec les éditeurs et partenaires de l’évènement pour repenser les usages du livre numérique. 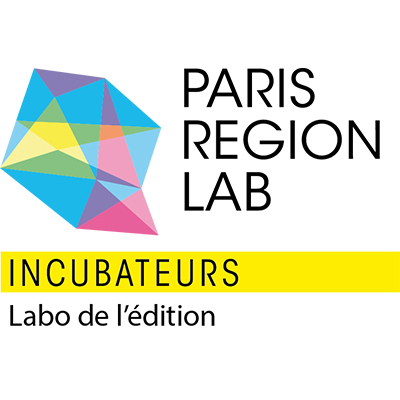 Plusieurs retours sur ce hackathon auront lieu dans le cadre d’événements en 2015 : au Salon Demain Le Livre en février 2015 et au Salon du Livre de Paris en mars 2015. 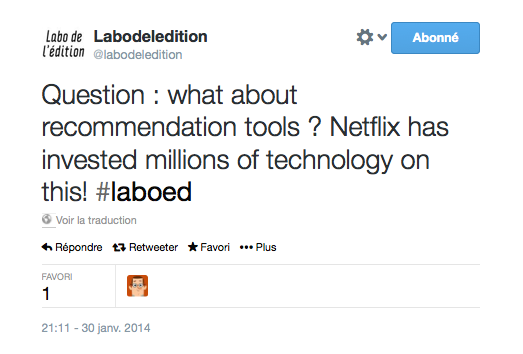 Plus d’informations sur l’évènement sur le site du Labo de l’édition. HACKATHON from sylvain CHAUX on Vimeo. Following the success of subscription offers in the music and film industry, online streaming companies are emerging. With Netflix and Spotify paving the way for new players, the streaming model seems to apply to various cultural industries. There are great expectations for the publishing industry. To discuss its evolution in the e-book market, the Labo de l’Edition organized a round-table debate with three promising start-ups. We gathered the co-founders of two freemium reading platforms: Justo Hidalgo from 24symbols, launched in Spain in 2011 and Hélène Mérillon from Youboox, in 2012 in France. The third speaker, Thomas Salomon, co-founded Storyplay’r, a reading and recording streaming service dedicated to children’s books, incubated in the Labo and available since end of 2013. To benefit from his in-depth knowledge of the leading industry in the streaming business, we asked Rémi Bouton, media and music journalist, to moderate the discussion. His introduction about the music business digital evolution allows us to understand better the issues and specificities of streaming books services. As the first cultural industry to enter the digital age, music appears as a laboratory for online consumption. Strongly facing piracy, the music industry is struggling to find profitable and attractive models. In 2013, digital sales represent 50% of the global music market, but the proportion between downloads and streaming offers varies depending on countries. For the first time the past year digital music sales decreased in favor of ad-supported and paid subscription offers, such as Spotify and Deezer. In North Europe, streaming has already cannibalized the digital sales and has emerged as the main way of consuming music. However, the economical model is far from being financially viable for the artists: the average revenue for a stream is 0,007€. According to forecasts, this hurdle can be cleared by the increasing number of subscribers, from 29 million at the end of 2013 to 191 million by the end of 2018. To foresee this expansion, Rémi Bouton evokes the increase of partnerships with telecom companies and household equipment in mobile devices. 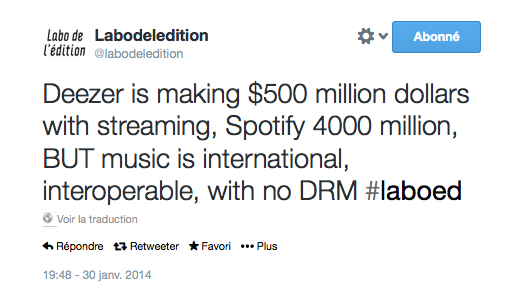 Can the digital music streaming model adapt to the publishing market? Rémi Bouton recalls some essential differences between the two industries. The book industry appears to have inherent limitations that can impact the growth of the streaming model. A strong local integration supported by various national legislation, but also the use of DRM and non-interoperable devices might curb the expansion of streaming platforms in the publishing industry. Moreover, it should be pointed out that platforms such as Spotify and Netflix could emerge in the music and film industry and distribute major labels catalogues because of the increasing rise of online piracy, which is not an actual threat for the book industry. Thus, we should take into consideration consumer’s habits before applying to the ebook market the same rules as other cultural industries. Even more, the music industry is dominated by three major labels which represent 90% of the global market. The publishing world is far more partitioned with a multitude of local companies. These limitations are nothing but challenges to overcome for the three start-ups participating in this event. When starting his company in 2011 in Spain, Justo Hidalgo identified some key issues to streaming books services: access, engagement, business. His platform, 24symbols, is made to address the needs of users for full access and low-priced subscriptions as much as the ones of publishers for visibility and fair compensation. The start-up shares with the publishers partnering the same purpose: making people read more. It means that its direct competitors are not only online and offline publishers but mostly “Angry Birds, Farmville: anything that will keep people from reading”. Thus, 24symbols benefits from the technical background of its founders and offer a great user experience through an ATAWAD service, meaning users can access books anytime, anywhere, on any devices they want. 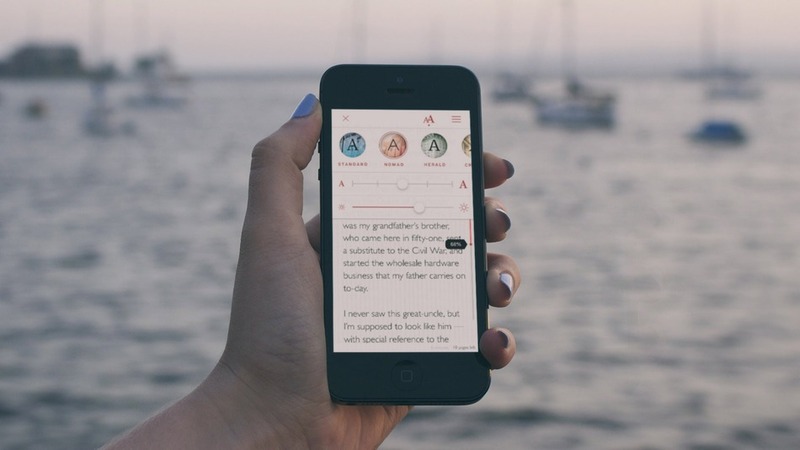 The interface turns the reader into a librarian: discovering new books, organizing his readings on bookshelves and sharing it with his followers. In France, Hélène Mérillon wants her start-up Youboox to grow extensively and aims at conquering the francophone world. The young start-up wants to build a bridge between users digital practices and publishers concerns about monetization. With a wide selection of books, they tend to reproduce the brick and mortar bookstore recommendation expertise. Attached with a strong social engagement strategy, curation can be a value-added service for readers and publishers. On another level, Storyplay’r is a brand new application launched a few months ago by Thomas Salomon and Edouard Morhange. 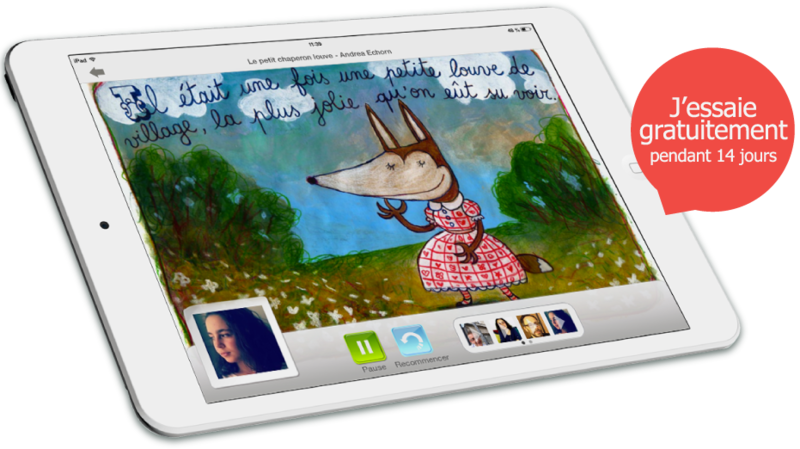 Focusing on the importance of storytelling for children’s learning and cognitive capacities, the platform allows parents to read, record and share books to their children. Again, digital tools are used to replicate experiences with printed books. The freemium model, one of the two business solutions adopted by 24symbols, is directly inspired from Spotify and Netflix. It allows the premium user to access ad-free content offline from 5€ per-month for an annual subscription to 9€ for a monthly subscription. The same business model is adopted by Youboox, founded in 2012 in France, with a premium offer that allows the user to access 50K books from more than 120 publishers for 9,99€ a month. For Storyplay’r, the subscription model imposed itself as it is recurrent in the youth sector. For 7,90€ a month, parents can access 150 children’s books, and publishers are compensated depending on the number of times a book has been open for reading. On both 24symbols and Youboox, publishers are compensated for each page read, but while 24symbols follows Spotify and give 70% of the total revenue (advertising and subscription) to the publishers; Youboox and Storyplay’r share half of the total income with their partners. As well, the Spanish start-up makes no difference of revenue between the premium and the free offer, whereas the revenue for publishers on Youboox is approximately 3€ for free reading and 10€ for a premium reading of a thousand pages. Although Thomas Salomon demonstrates that multiple readings of a single book on a long-term subscription can generate as much money for the publisher as a printed book revenue; the three companies are facing publishers’ apprehension. Offering one-year distribution contracts as a “phase of seduction”, 24symbols remarks a strong improvement of the confidence publishers put in them since a few months. A new business model coupled to the freemium one can explain that sudden evolution. Based on partnerships with telecommunication companies, 24symbols is being given to any new mobile subscribers, increasing intensively the number of users. This strategy is helping the internationalization of the start-up, especially to countries where credit cards are not the common-used payment mean. It works as a book-club, with a system of monthly credits allowing users to read a certain number of books. In this way, the “book club” model of 24symbols generates revenues per book chosen to publishers. This surely is a viable solution for the publishers and authors as demonstrates the new start-up Entitle, with high-priced offers (from 2 e-books for 9,99$ a month) and nearly 90K books on the platform. From that, the question is whether readers will positively accept this constraining selection. 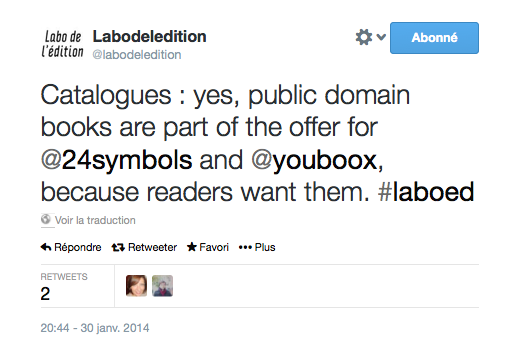 The actual catalogue of 24symbols and Youboox is growing from rising partnerships and public domain books. These two sources demonstrate the necessity to provide classical works as well as the difficulty to access recent literacy publications. In that sense, streaming platforms allow publishers to ensure visibility and profitability from their back catalogues. Close to Netflix’s model (more than Spotify’s), these start-ups can offer diverse types of books to seduce niche markets, if not the fresher ones. The experiences of the three companies have proven that smaller publishers are more prone to partner than bigger ones, and that some literacy genre such as sci-fi or comics show greater enthusiasm for these models. As distributors, they receive the e-book from publishers (in epub for 24symbols, pdf for Storyplay’r and both for Youboox), but they show their attention to great content through careful verification works on the metadata. Streaming books platforms need to balance a wide and diversified range of books with a qualitative selection to achieve the development of curation and recommendation tools. For the three start-ups, the key word to success is “discovery”. As Netflix or Amazon, they want to use their knowledge of users’ reading behaviors to build strong recommendation tools to advice good readings and foster the relationship between the digital library and its subscribers. Still in the early stages, the start-ups want to build public APIs for social media interactions and recommendation algorithms to match the user tastes. For Hélène Mérillon, curation is the result of both technological and human abilities. Positive word-of-mouth can have more value than the best recommendation system. Still, the next challenge for the three players is to collect more detailed data and learn datamining to enhance the level of engagement. Is it the future of reading? Streaming books platforms are rising in the United-States, with the New-York-based start-up Oyster raising $14 million and partnering with HarperCollins. Unlike many streaming companies attracting heavy readers, Oyster business model pay publishers 60% of the book’s retail price when readers reach 10% of the book, meaning they aim at attracting moderate readers to become profitable (around 3 to 4 books a month). Being publishers-friendly is, with no doubt, a determining factor to reach big players. The North American market has demonstrated its maturity for streaming solutions, and the VC’s eagerness to support and bring out these types of offers surely is a guarantee for major publishing firms. In France, the extensive telecommunication network and the decreasing cost of mobile devices is assuring a promising future to the streaming of books. However, the main issue remains in the relationship between emerging start-ups that fits consumers’ needs and major publishers that dread the dissolution of the book’s value. Like music companies, publishers concern seems relevant in regards to this recent mutation in our cultural habits. This raises the question of the coexistence of several distribution services. In the near future, will this model cannibalize online and offline sales as it did in the music business? For Thomas Salomon and the two other speakers, subscription-based solutions can be complementary to printed publications. The two forms of media correspond to different ways of consuming cultural goods: from the need of property to the “access age” would say Jeremy Rifkin. Streaming platforms: a breeding ground for innovation? 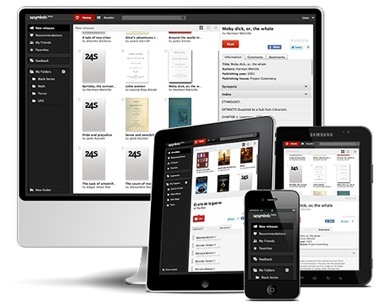 As an innovative solution, should streaming companies play a part in the evolution of books? By encouraging full access and higher consumption of books, streaming platforms could become big players in the digital publishing market and therefore boost digital reading. In this way, they could encourage as well niche publications and interactive formats to multiply. But 24symbols and Youboox remind that it is the publisher’s role to produce “good and inventive books” while they provide a great distribution platform for their works. Finally the question of the author’s role in this system has not been deeply discussed. It appears that these platforms, using recommendation as an essential tool, could be a valuable asset for indie authors to experiment and grow in popularity; or for independent publishers to draw attention to unknown works. To learn from Rémi Bouton’s expertise and observations on the conference, the article on his blog « La Guerre du Bouton » (in French). 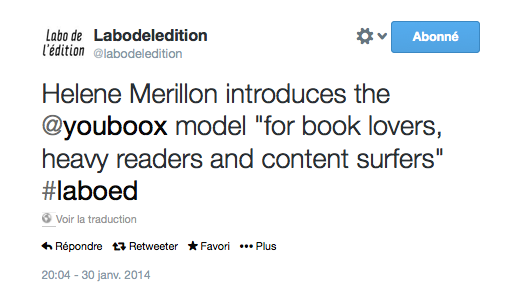 To read more about books streaming solutions, Frédérique Roussel’s article in Libération, 12 janvier 2014 (in French). Listen to the conference on Soundcloud here. Check out 24 symbols presentation and Youboox presentation on Slideshare.